When it comes to reviewing Italian products we’re pretty blunt and we’ve, unfortunately, offended a few Italian product manufacturers with not so positive feedback. In fact, when companies approach us to review already prepared products we often turn them away for fear of writing yet another negative review. In turn, many of our favorite Italian products are simple and basic items like extra virgin olive oils, artisan pastas, salumi, cheese, canned items, etc. There are exceptions like Gelato Di babbo, Aroma Antico tarallini, etc. but you won’t find us talking about canned tomato sauce or frozen Italian meals produced by large consumer packaged good companies. So, with the above in mind, I was skeptical when Lee Greene approached us about giving our honest feedback on the products her company, The Scrumptious Pantry, produces. I was expecting yet another jarred tomato sauce or even worse some sudo seasonal Italian American junk full of preservative with a long shelf life. What I discovered was the complete opposite; namely, basic food made with care on small, family run, farms in Italy and America. I needed to go to Italy and struggle up our up-wards sloping vineyards, spraying biodynamic preparations from a heavy copper tank on my back to realize that if this was the effort necessary to grow healthy food in a healthy environment, I had surely been eating wrong for the first thirty years of my life. Real food, small farmers needed a platform. So we set out to create The Scrumptious Pantry. At The Scrumptious Pantry, we care about what you put in your belly, how you nourish your body, because that also nourishes your soul. The above isn’t just marketing speak (trust me, I”m a professional marketer when I’m not writing here on Scordo.com) rather her philosophy is baked right into her product line. Lee allowed us to sample durum wheat pasta (rigatoni and farfalle), two extra virgin olive oils, and a jar of sun dried tomato spread. 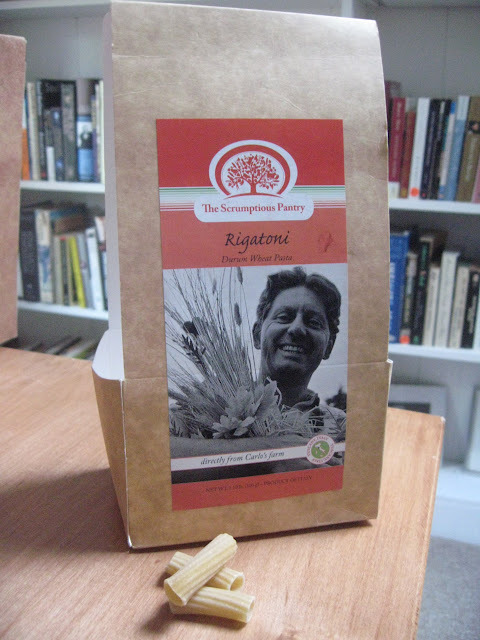 The durum wheat pasta I sampled was made in Italy by the farmer “Carlo” and made of Semolato of Durum Wheat, including about 90% of the grain (compared to 60-70% in regular Semolina pasta). 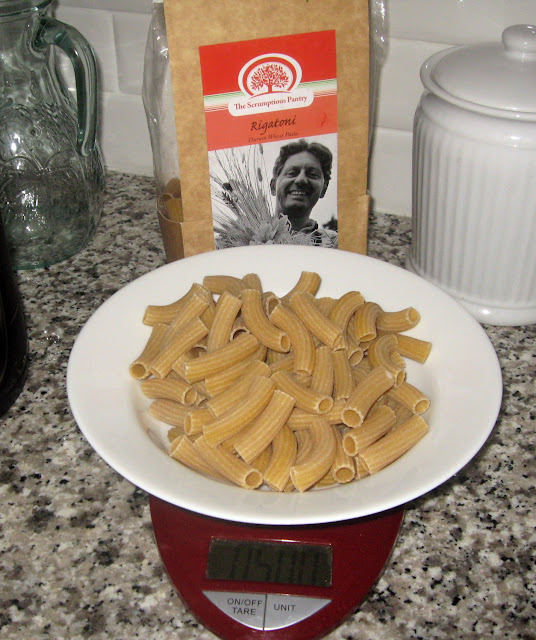 Carlo’s durum wheat pasta is easier to digest , contains more nutrients than pasta made of Semolina and preserves delicate taste (compared to 100% whole wheat pasta). We made a simple dish of rigatoni with braised zucchini, red onion, garlic, and spinach and the pasta was hearty yet delicate, full of incredible flavor, and tasted not like durum wheat pasta but rather very good pasta (the highest compliment for a non traditional Semolina pasta). 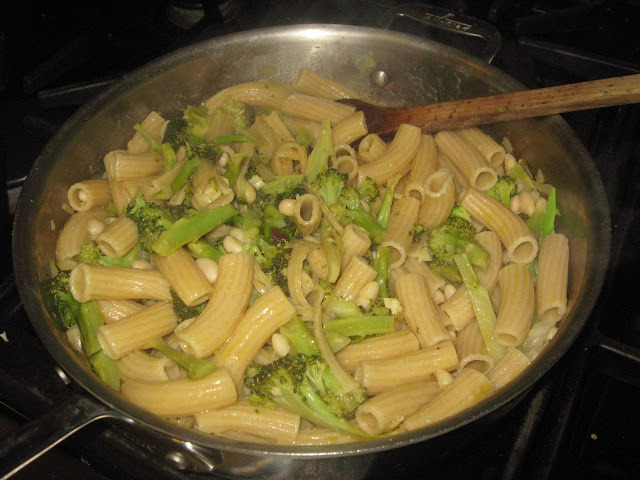 We also made a second dish with the pasta including broccoli, beans, and garlic (pictured below). 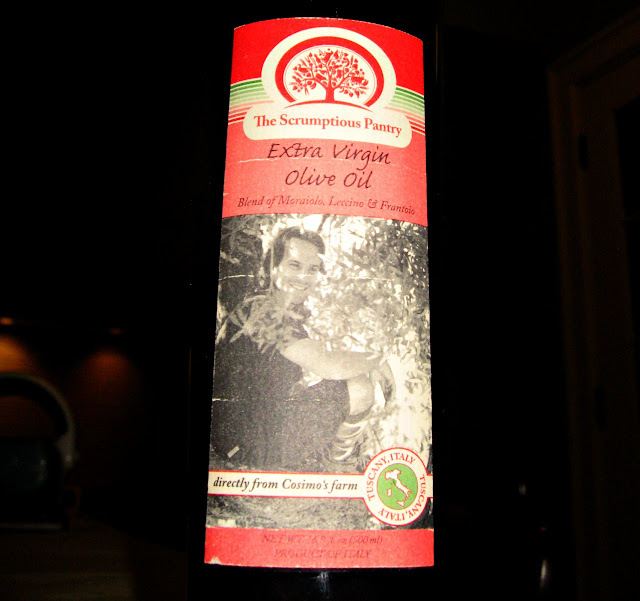 The organic extra virgin olive oil used in the pasta dish above was produced by the farmer Cosimo in the Chianti region. Cosimo uses moraiolo, lecchino and frantoio olives to produce it’s oil and it’s best suited for finishing dishes, including pasta (however, I must admit I used it to cook my vegetables and garlic and it was tremendous). The final product we sampled was a jar of sun dried tomato spread and boy were we skeptical before we placed a spoonful of the minced and dried tomatoes in our mouth. Simply put the jar of sin dried tomato spread was the best sun dried tomatoes in olive oil we tasted outside of the small batches we make here in the US from Calabrian sun dried tomatoes. The tomatoes for the Scrumptious Pantry are produced just north of Florence in Antico Colle Fiorito by farmers Roberta & Giulio. The jars of sun dried tomato spread are fantastic and should be sampled by tomato lovers everywhere (the only caveat is that they are not whole, sliced, tomatoes).